The word” “damsel” is usually paired with “distress,” but in this wonderfully offbeat sagebrush saga of the same name, the damsel is anything but in distress. It’s actually the men who seem to have their share of problems, making the title ironic and fitting to the oddball pleasures of this little film from the idiosyncratic filmmaking team known as Zellner Brothers (Kumiko the Treasure Hunter). It’s the Wild West circa 1870, and Robert Pattinson (The Lost City of Z) is Daniel, a green cowpoke who arrives in a small western town with a miniature horse, fixing to marry Penelope (Mia Wasikowska, Maps to the Stars). Enlisting the services of a phony man of the cloth named Parson Henry (co-director David Zellner, Ain’t Them Body Saints), Daniel sets out to find his bride-to-be, but when he learns Penelope has been kidnapped, the quest for Daniel to get hitched becomes much more complicated. 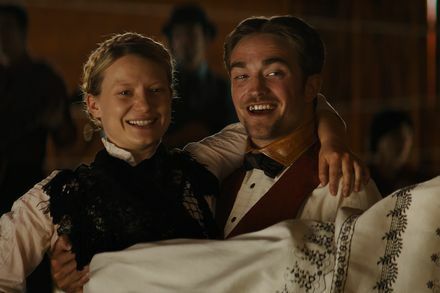 Damsel is a quirky delight from start to finish. Sometimes, it feels like it crawled out from under a rock, hibernating since the Seventies with other curve-throwing revisionist westerns of the era like The Hired Hand, Rancho Deluxe or The Missouri Breaks. Seemingly impulsive behavior from its characters and an unpredictable plot blow the dust off the western conventions. Helping the film succeed on its own terms is the game cast highlighted by Pattinson–taking further steps to remove himself from the Twilight franchise—as the determined but naïve leading man; Wasikowska as the surprisingly sharp, feminist heroine; Zellner as the garrulous bogus preacher; and, in a prologue, the always welcome Robert Forster (London Has Fallen) playing another preacher—we won’t spoil the surprise. Damsel arrived on Pay-Per-View and in a limited number of theaters on the same day, and, to no one’s surprise, failed to garner any enthusiasm from audiences despite some critical praise. If you like your westerns cliché-defying and the mindset of your movies “independent-friendly,” this one’s worth roping in.